Idle Hands: SDCC 2016 Exclusives: Applehead Factory's EXCLUSIVE MAN!! SDCC 2016 Exclusives: Applehead Factory's EXCLUSIVE MAN!! 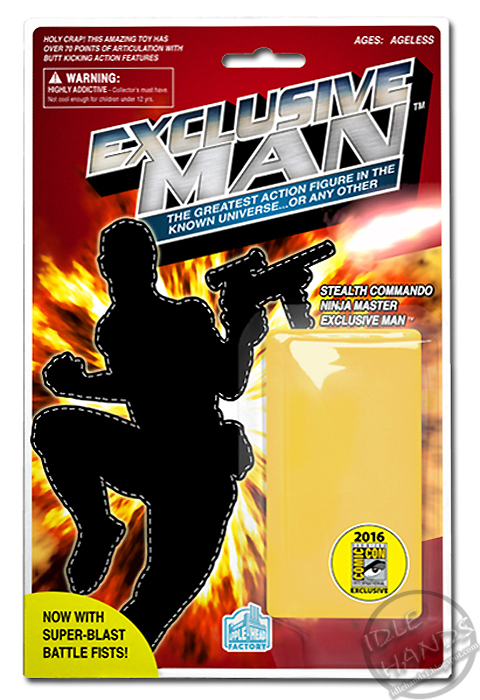 In the spirit of exclusives made specifically for San Diego’s Comic Con, Applehead Factory Design Studio has created the ultimate of all exclusives… Stealth Commando Ninja Master Exclusive Man! The earth-shattering debut of the greatest action figure to ever grace toy shelves or the known universe will be at this year’s Comic Con! Made from the remnants of crappy 80s cartoons and the tears of lonely fan boys, Stealth Commando Ninja Master Exclusive Man has it all! Super blast battle fists, Vesuvian death toe-grip, a disintegration ring, and an Andromeda codpiece allow him to handle whatever comes up day or night! With over 3,141,996 points of articulation no action figure in this or any parallel reality compares. S.C.N.M.E.M. is packaged with exquisite full-color cardboard backing that tells his mind-blowing back-story and sports the official San Diego Comic Con exclusive seal! He’s packaged in a blister bubble to preserve his worth, which is filled with real, Comic Con, collectible, exclusive air! 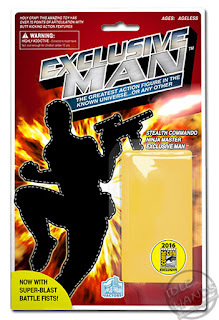 At only $6.00 Stealth Commando Ninja Master Exclusive Man is a steal as a keepsake of your visit to San Diego Comic Con or as a gift for the serious action figure collector in your life! They’ll be selling faster than one of his patented brain-liquefying kicks to the head, so get yours before he vanishes from Booth #4923… oops, too late!